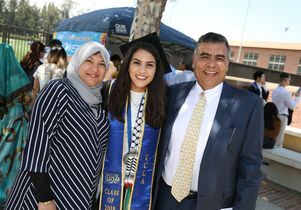 First in line to march for UCLA College commencement 2018. 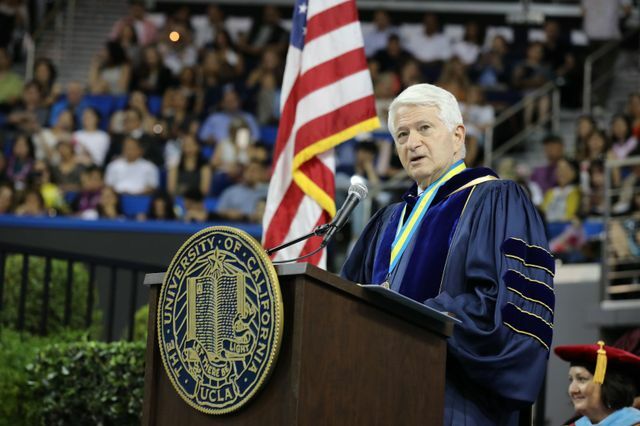 Chancellor Gene Block speaking at the 2018 UCLA College commencement in Pauley Pavilion. 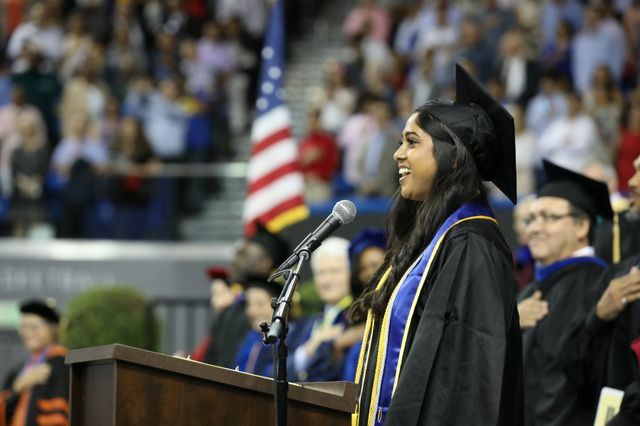 Ritu Sreenivasan performs "The Star-Spangled Banner" at the UCLA College commencement in 2018. 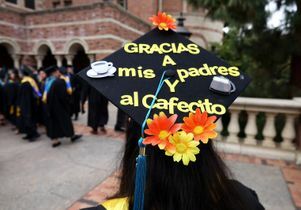 Thanks Mom and Dad. 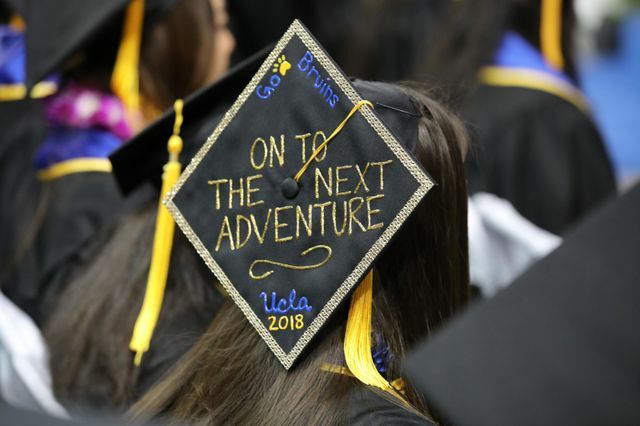 UCLA College commencement 2018. 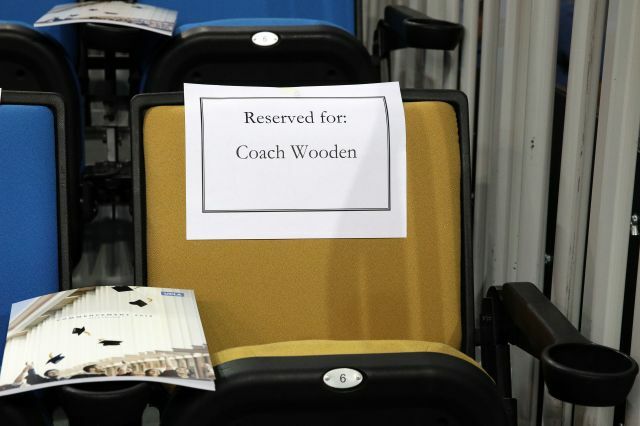 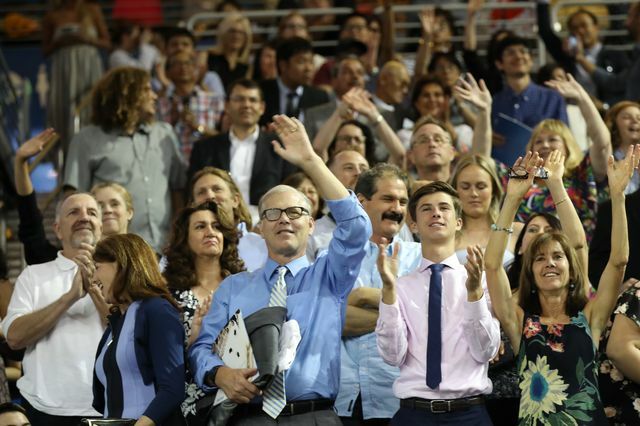 In the Pauley Pavilion audience at UCLA College commencement 2018. 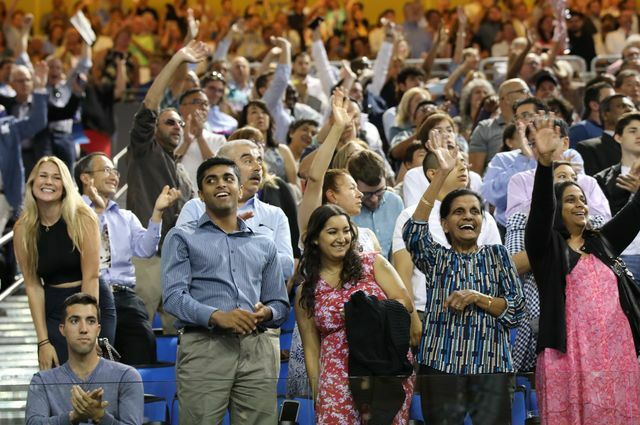 Pauley Pavilion happiness. 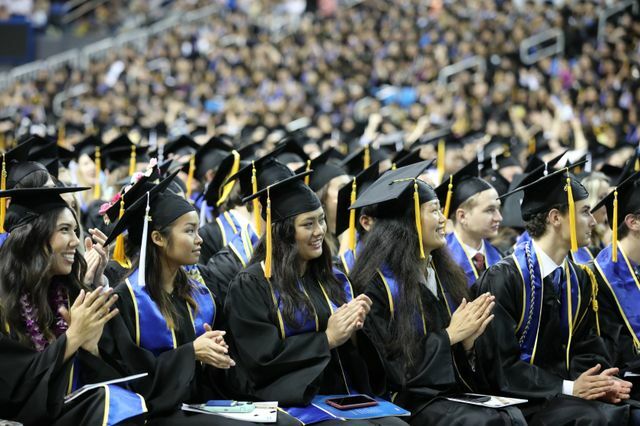 UCLA College commencement 2018. 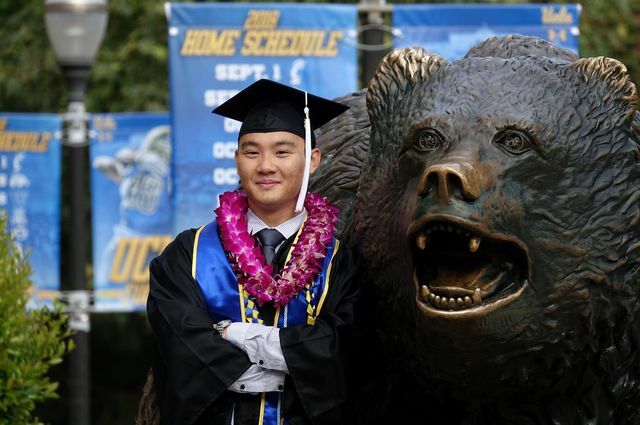 Graduates at the UCLA College commencement in 2018. 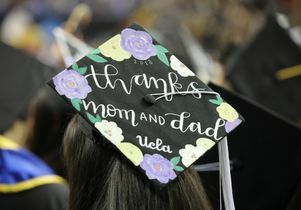 Decorated cap at UCLA College commencement 2018. 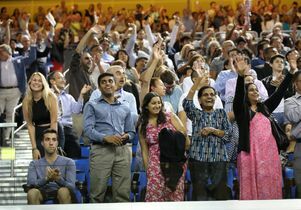 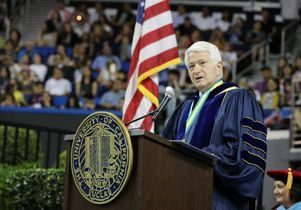 Thousands of graduating UCLA students bursting with four years’ worth of hard-earned knowledge were reminded by speakers to remain open to challenging ideas, and to prevent ideology from calcifying their opinions. 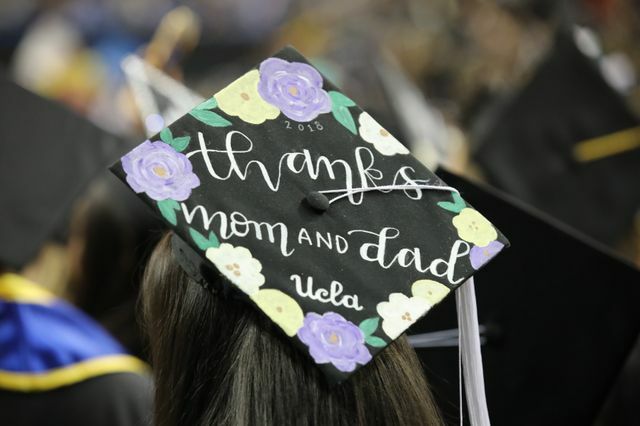 Before Friday’s UCLA College commencement, the campus filled with festive families and friends, carrying balloon bouquets and flower leis, holding the hands of small children or the leashes of small dogs, walking in groups or rolling singly on motorized scooters and skateboards. 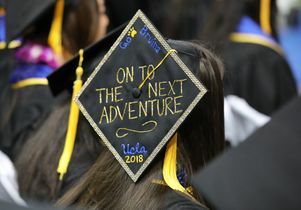 Graduation season at UCLA includes nearly 60 ceremonies, receptions and celebrations across campus, the bulk of them taking place Friday or this weekend. 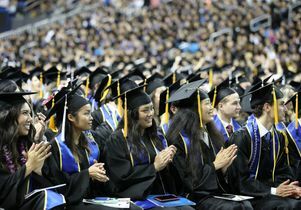 The two undergraduate commencements inside UCLA’s historic Pauley Pavilion are the largest events, where roughly 20,000 guests saw more than 5,800 students earn their diplomas. 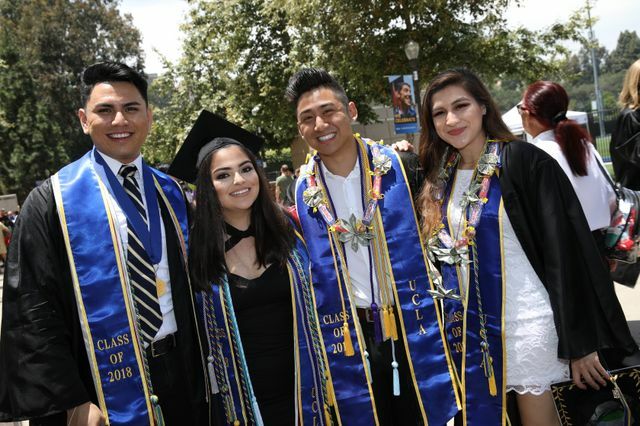 UCLA is awarding about 4,700 graduate and 8,300 undergraduate degrees this academic year to a diverse array of students. 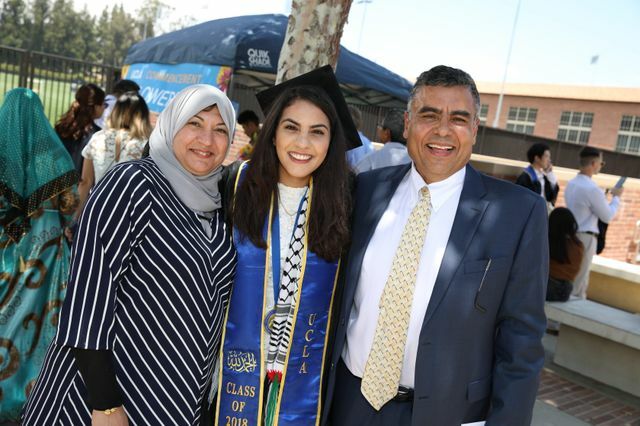 Roughly a third of UCLA undergraduates are the first in their family to attend college, and more than a third come from low-income families. 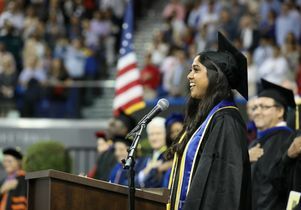 They’ve seen the world change in significant ways over the past four years, said graduating neuroscience major Gauri Ganesh as she waited with friends to march into Pauley. 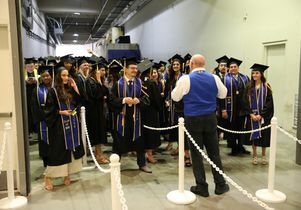 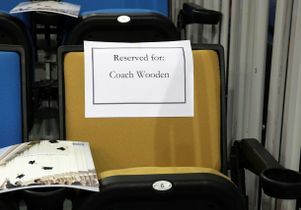 The graduates heard speeches that touched on the turbulent social issues that colored their college years. 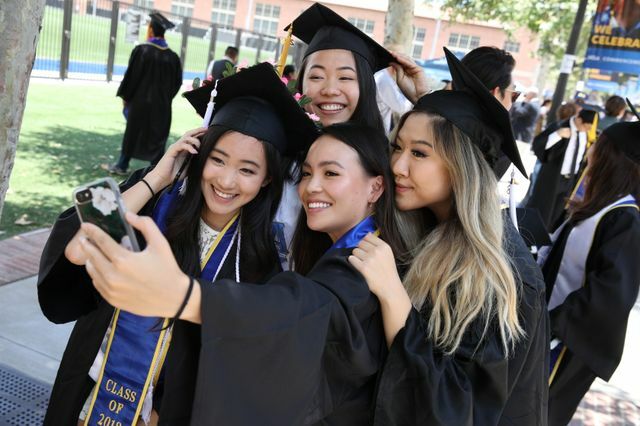 Chancellor Gene Block congratulated them on being the best UCLA class yet, and answered questions that students had sent in advance about how to approach uncertainty, how make the world better, and how to connect with community. 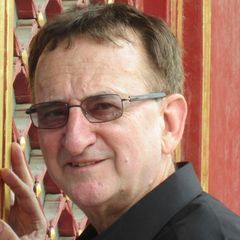 The answers lie in remaining open to different ideas, even when they are challenging or upsetting, Block said. 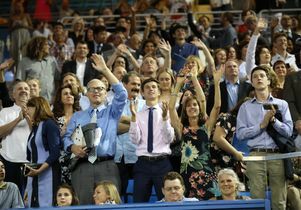 Block reminded them that as they face challenges like solving homelessness, gun violence and climate change, they are not alone. 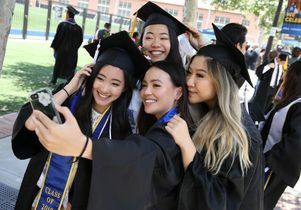 Graduating senior Emily Yamane, who earned her degree in applied mathematics, reminded her classmates that they are the latest in a long line of influential Bruins, mentioning Nobel Peace Prize-winner Ralphe Bunche, co-inventor of the internet Leonard Kleinrock, and Carol Burnett, who received the Presidential Medal of Freedom for blazing a trail for women in entertainment. 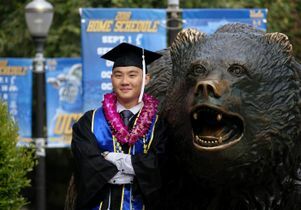 Her classmates, Yamane continued, have already begun inspirational work that carries on that Bruin tradition. 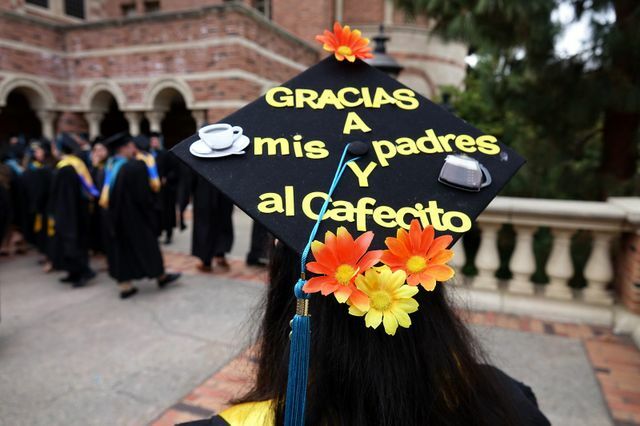 This year’s graduating seniors have already faced challenges in their path to graduation and in their lives, including three Native American siblings who are showing students on their reservation that they can get into a top university; the son of Salvadoran immigrants whose father has worked for UCLA Housing and Hospitality Services for 18 years; and the former bus driver now earning her degree in psychology and LGBTQ studies. 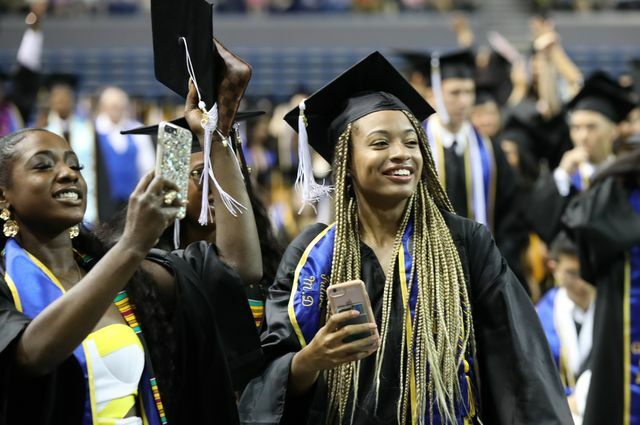 Yamane highlighted her classmates’ diverse backgrounds, and praised them for overcoming a variety of struggles. 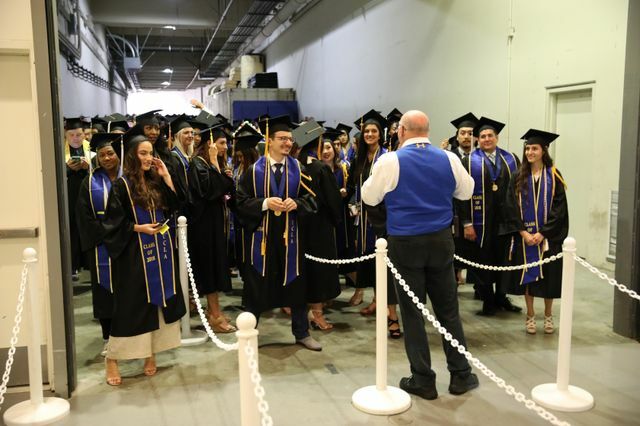 When it came time to turn tassels to the left and officially graduate, the arena reverberated from the volume of students and guests cheering. 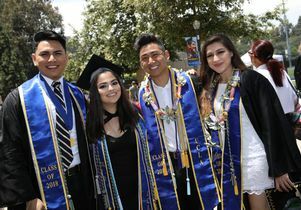 As a quartet sang the alma mater, “Hail to the Hills of Westwood,” students stood, cheered and swayed to the music. 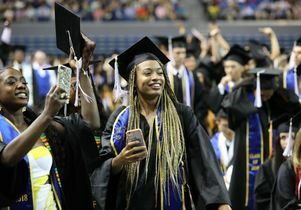 The volume swelled again as the graduates added their voices to the final line of the song, and threw their caps in air.